Review of Sierra Nevada 30th Anniversary Black Barleywine Ale | Beer Apprentice - Craft Beer News, Reviews, Interviews and Info. 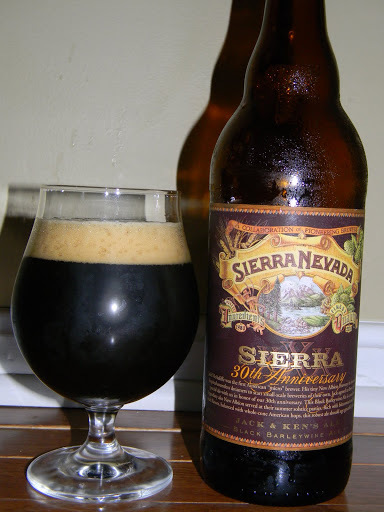 For today’s review I’m going to spotlight another one of the Sierra Nevada 30th Anniversary Special Releases. This time it’s the Black Barleywine Ale. Of course, the Sierra Nevada Brewing Company (sierranevada.com) is located in Chico, California and they make some of the most solid craft beers in the world, so I have no doubt that this beer will be worth its weight in gold. From the website, sierra30.com, we find this description. Jack McAuliffe is the original microbrewer. McAuliffe’s tiny New Albion Brewery in Sonoma, California inspired countless brewers to start small-scale breweries of their own. Jack agreed to guest brew this very special ale with us in honor of our 30th anniversary. This American barleywine is a nod to the big ales of New Albion served at their legendary summer solstice parties. It is robust and complex – brewed with 100% American Cascade hops. I can’t wait to try this brew!!! This Barleywine stands in at a hefty 10.2% ABV and comes in a beautiful 25.4 oz. bottle. Once poured, this beer appeared a very dark burgundy/black color with absolutely no highlights showing through. Very nice girth on a tan, chocolate milkshake colored head that had tremendous retention and fine, sticky lacing. The crown looked smooth, creamy and very soft. Once it settled it left a silky, smooth film on top of the liquid. Some nice alcohol “feet” were noticed when I tilted the beer from side to side too!!! Man, this thing looks good!!! The aroma brought forth some roasted, deep, dark malts. A sweet molasses and burnt sugar coincided with some light whiffs of boozed soaked raisins and prunes to delight my nostrils. Very pungent and aromatic. I even started to get a touch of chocolate and coffee bean juxtaposed with some nice hoppy tones. Deep in the fragrance, I started to detect some dry, leafy tobacco hints. Very nice. It was wonderfully balanced and complex. A lot going on here with the nose. With the first sip, I immediately picked up on deep, roasted malts of toffee, caramel, coffee and a touch of charred nuttiness. A syrupy molasses added some more sweetness and a toasted biscuit flavor gave the profile a bit of “roundness.” Slight Bourbon profiles touched on some vanilla and brought about a very welcome alcohol flavored warmth and burn. A small hop bite of grapefruit citrus mixed nicely with more of the alcohol laced dark fruits of raisin, prunes and even some cherries. An earthy, herbal, tobacco savor crept in for a final parting shot. This thing tastes great!!! Again, super well balanced, robust, complex and harmonious. The mouthfeel was a very sturdy medium. It’s dry, somewhat creamy, viscous and slick. A smooth warmth covered the palate, slid down my chest and into my belly. The burn however, really started to mellow as the beer warmed and my palate adjusted. It still left behind plenty of flavor for me to enjoy until I took the next sip. Wow!!! A superb beer. That’s about all I can say. This is a great sipping beer with tons of character and personality. It’s not a super easy drink because of the high ABV, but it is far too good to rush through anyway. Still, be minded that the 10.2% will get on top of you in a hurry if you are not careful. One must take time to savor the beer and let it open up and develop. I’ve loved all the 30th Anniversary’s I’ve tried and this one was no exception. I’m so happy that I was able to obtain 2 more bottles of this to put back and cellar. If you have not tried this beer and happen to see one sitting on the shelf somewhere…. don’t hesitate to pick it up. It’s worth the hefty price tag. Sit and enjoy this brew when time permits. Have you had the Sierra Nevada 30th Anniversary Black Barleywine? What did you think of it? Thanks for reading and commenting everyone. It’s most appreciated. This review made my mouth water. Haha. That's what it's all about!! !